Priyanka Borpujari has had an eventful and laudable journalistic career. Beginning with a Bachelors of Mass Media in Journalism, she has been a research scholar at MIT (Massachusetts Institute of Technology) as a result of being awarded the IWMF (International Women's Media Foundation) Elizabeth Neuffer Fellowship (2012-2013) for journalism in human rights and justice. She co-founded the youth magazine Yuvaniya for the Bareli tribe in western Madhya Pradesh, in alliance with the Adharshila Learning Centre. The Asian Age and the Mumbai Mirror are two newspapers that Priyanka has worked for, besides being a guest columnist for The Boston Globe. Reporting human rights violations in Chhattisgarh, Jharkhand, Odisha, Assam, and Gujarat as an independent journalist since 2009, she has contributed to Al Jazeera, The Hindu, Tehelka, Down To Earth and many more prestigious news publications. 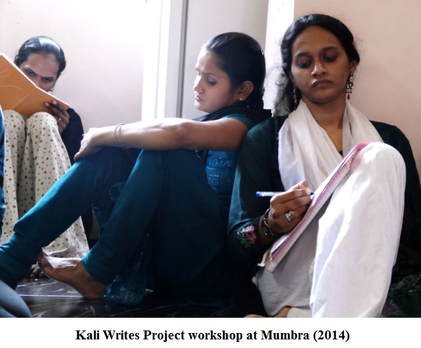 Having donned many hats as a journalist, photographer, and researcher, Priyanka founded the Kali Writes Project in 2014 and began conducting workshops related to it. Priyanka says, ‘As journalists, we go into places and ask about hurt and grief, but nothing happens after that.’ Her aim behind this project was to go a step further, attempting to bring relief and alleviate suffering. ‘I realised through my own experience that writing is a cathartic process and that others would also find it cathartic. There are other means to catharsis like dancing, singing and so on. For me, it is writing, and I decided to share it with others,’ says the passionate young journalist. The project is named for the Hindu Goddess Kali, who represents the negative and positive in all humans, since she is depicted as death and destruction on the one hand, and fertility, creativity, and motherly love on the other. The title aptly conveys the goal of the project, which is to bare our souls to ourselves through the process of writing. The workshops are usually conducted over two days of six hours each (with a few exceptions), and the participants write poems, essays, stories, letters, etc, which are refined through dialogue and feedback within the group. 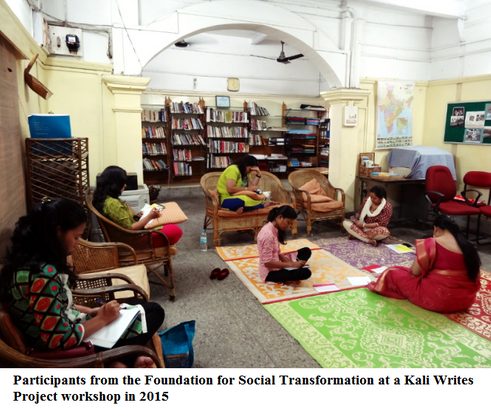 The first workshop under the Kali Writes Project was held in collaboration with Awaaz-E-Niswaan (Voice of Women), an organisation that Priyanka is linked with and which supports Muslim women. The two-day workshop at Mumbra, on the outskirts of Mumbai, was held in April 2014. It proved to be a liberating experience for the thirty participants, who were initially reticent but overcame it to produce poignant pieces of writing about their bodies and ideas of freedom. ‘People say journalism gives a voice to the voiceless. You might as well give them the pen to write with,’ says Priyanka. Ek Chaah Khule Aasmaan Ki, which translates as One Wish for an Open Sky, became the title of the book containing selected essays by these Muslim girls. From Mumbra, Priyanka took her workshop to Kuils River, Cape Town, where she worked with girls and women who had witnessed life during the apartheid era and after it. As a Fulbright Scholar in 2016, Priyanka made her way to the USA as part of the English and Communications Department at Nazareth College. While she was there, she undertook a series of workshops on several Fridays for one hour at a time with the male inmates of Monroe Correctional Facility, Rochester, NY. These were men who were recovering from substance abuse as well. The freedom to express themselves in simple ways, such as writing about their favourite season and their relationship with one another, was therapeutic and unshackled them emotionally and mentally, to say the least. Priyanka says, ‘All the workshops have been memorable. I have a set module for the sessions. It is the people who are different and you never know how they will react or what they will bring in.’ Referring to the sixty students from TISS, she explains how the number was too great for a single workshop because the workshops are meant to be an intimate space. It was decided that the students would be divided into three batches of twenty for three separate workshops. Though the numbers decreased as the workshops progressed, she says, ‘Every batch was very unique because all of them were such unique individuals. Though the first workshop at Mumbra was an eye opener that yes, there is value to what I want to bring through this project.’ So also was the workshop held for the prison inmates an encouragement to continue. 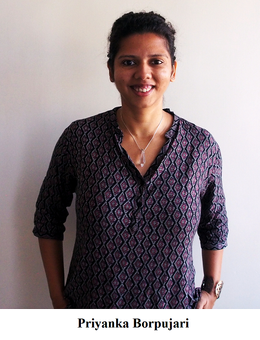 Priyanka, who continues to be a full-time journalist, hopes to continue with the Kali Writes Project but is trying to work strategically on the economics of it. She endeavours to reach out to organisations that work with vulnerable sections of society, as well as with privileged groups, who, she states, have inner struggles just the same as the underprivileged albeit in different forms and on varying levels. Priyanka will be speaking at 6 Assagao in Goa on independent journalism on the 14th of August. She will be conducting workshops at the Museum of Goa, Pilerne, on the 16th and 17th of August and at The Dogears Bookshop, Margao, on the 18th and 19th of August. please visit kaliwritesproject.wordpress.com. All photographs are courtesy of Priyanka Borpujari.